Fireman 2065 vacancies available in Uttar Pradesh Prisons administration and Corrections Department, Fire Services Department. 3 separate notifications given for the recruitment of Jail Warder (Bandi Rakshak-Male, Bandi Rakshak Female) and Fireman Jobs. Selection for this Jail Warder and Firemen recruitment of UPPRPB will be held in 4 different stages of Merit percentage in 10th and 12th Class, Certificates verification, Physical Standard Tests and Physical Tests(Running) followed by Medical Test. 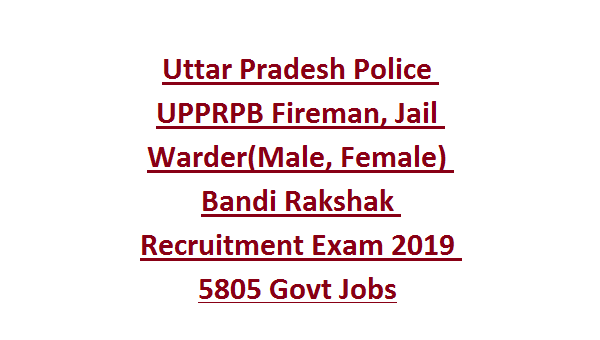 For more information regarding this Uttar Pradesh Police PRPB Recruitment of UP Jail Warder (Bandi Rakshak) and Fireman recruitment 2019 Vacancies see the information given below. Eligible candidates are suggested to apply online from 18-01-2019 to 09-02-2019 through official website of PRPB UP@prpb.gov.in. Online applications only accepted by PRPB Uttar Pradesh for the recruitment of Jail Warders of Prisons and corrections department, Fire Services of Fireman jobs. There are total 5805 vacancies available in this latest recruitment of Police Recruitment Promotions Board of Uttar Pradesh Police. Five years of age relaxations is given for SC/ST/OBC candidates. For more details refer official notification. For both fireman and jail warder posts candidates must have qualified 10th Board Exam and 12th Board Exam. Desirable Qualifications: DOEACC / NIELIT se 'O' Level certificate, 2 years experience in Territorial Army, NCC B Certificate. These qualifications are not mandatory but in merit these qualifications will be considered. Selection for this recruitment of UP Police Govt jobs of Fireman and Jail Warders will be held in 5 different stages. For Fireman and Jail Warder (Male/Female) posts Marks will be given candidates percentage based on 10th and 12th class up to 300 marks will be given. For ST candidates 147 cms. Physical test 4.8 km running will be completed for 200 marks. Candidates have to clear the 4.8 km running in less than 27 minutes. Mark allotment details will be given below. For female candidates 2.4 kms running will be conducted for 200 marks. Candidates have to clear in less than 16 minutes. Eligible candidates can submit the application form online using the official website of PRPB Uttar Pradesh @prpb.gov.in. After payment of examination fee update the same in online application and submit on or before 09-02-2019. 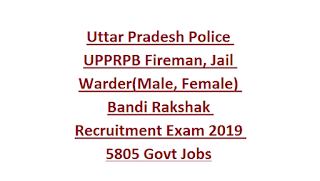 Click here to apply online for UPPRPB Jail Warder (Bandi Rakshak) and Fireman Jobs. Share this information with your beloved friends and help them to get a job, if you have friends? ?